This soup's got big chunks of vegetables and spiral-type noodles. It's hearty. The tomato-based broth is delicious, but not as much as TJ's Tomato Bisque which, I'm told, has been discontinued. 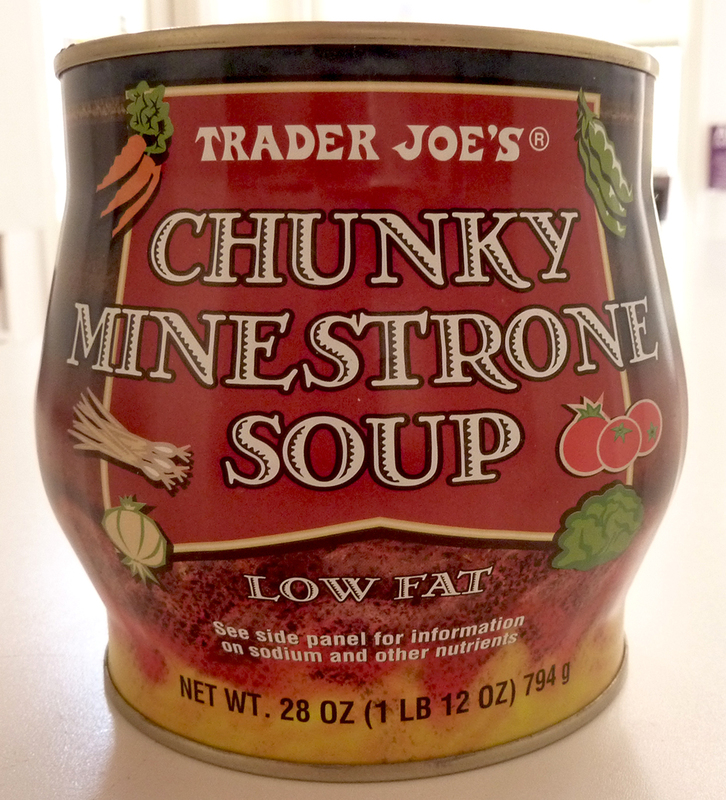 The minestrone broth has nearly as much flavor, but not half of the rich texture of the bisque. 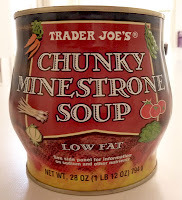 For those of you who've not tried Trader Joe's Tomato Bisque, and sadly may never do so, unless Trader Joe hears our cries of re-continuation, it was simply the best tomato-based broth I've ever had. By far. But this minestrone broth might take a distant second place, which, in the grand scheme of things, is still really darn good. 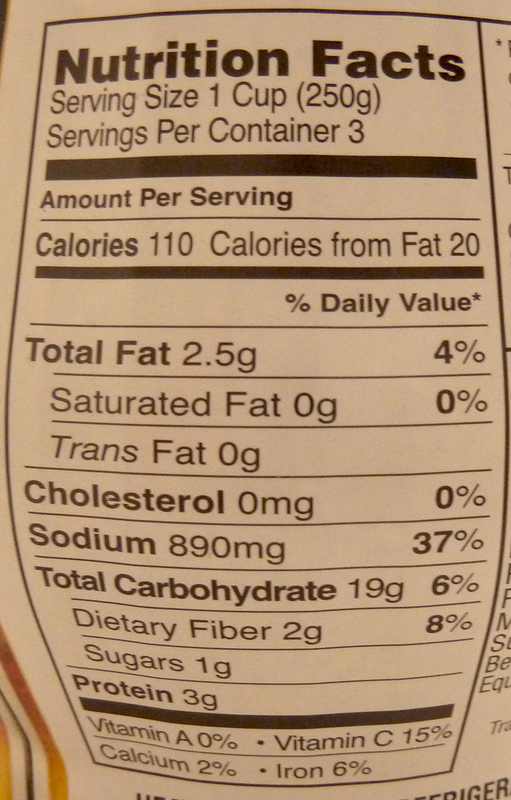 In addition to the silver-medal broth, there're thick pieces of swirly, carb-rich, rotini-esque pasta-things, carrots, green beans, peas, bits of cabbage, lima beans, celery, and potato, among other things, at least according to the packaging. 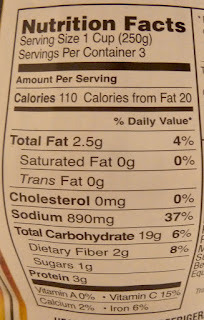 My wife and I didn't notice some of the ingredients mentioned on the can, including bell peppers and leeks, but that doesn't mean they weren't there. We're occasionally not-so-observant, especially on a Sunday evening right before the beginning of a long workweek. This soup is vegetarian. And, well, for vegetarians, that's of course good news. But for us omnivores, it's an area for potential improvement. A touch of beef could have made this side dish a bit more like a meal. I guess honest-to-goodness traditional minestrone doesn't necessarily have meat in it, but experimentation is a good thing sometimes. And, as TJ's has done in the past with other products, it couldn't hurt to offer both meatless and meatful options. Sonia would like to give this soup a 4, stating that "It's really hearty and tasty, especially for being vegetarian. It's better than Progresso and most brands." Like me, she does wish that it had a bit of meat, though. I'll give it 3.5 stars. It's on the chunkier, heartier side of meatlessness. that's why leftover chicken is good for. Yep - same thing... although TJ's was the same as Amy's LOW SODIUM Chunky Tomato Bisque. I buy it by the case! Ooh! Thanks for the tip about Amy's Tomato Bisque! This was our favorite soup. Unfortunately our Trader Joe's came out with a newer version (and recipe). Not as good. Hoping that other stores still carry this one.